We tested “Crazy man” in the pier of Tsuen Wan West in very light conditions (2-5 knots) and with a current quite strong (0,5 knots) in the same direction as the wind. In spite of these conditions, the boat sailed easily and against the wind. There was no wind close to the shore and a little bit more in the center of the channel. The boat was able to tack and to jib. Nevertheless, it is hard to say if the scales we put on the hull significantly improved the performance. We use some different materials for the boat. The hull and the gearbox are made in fiberglass with polyester resin. The top for gearbox is in 5mm plywood and the hull is made of flexible EVA foam (Ethylene-vinyl acetate). The scales are glued on the foam are made of sheet of polycarbonate. 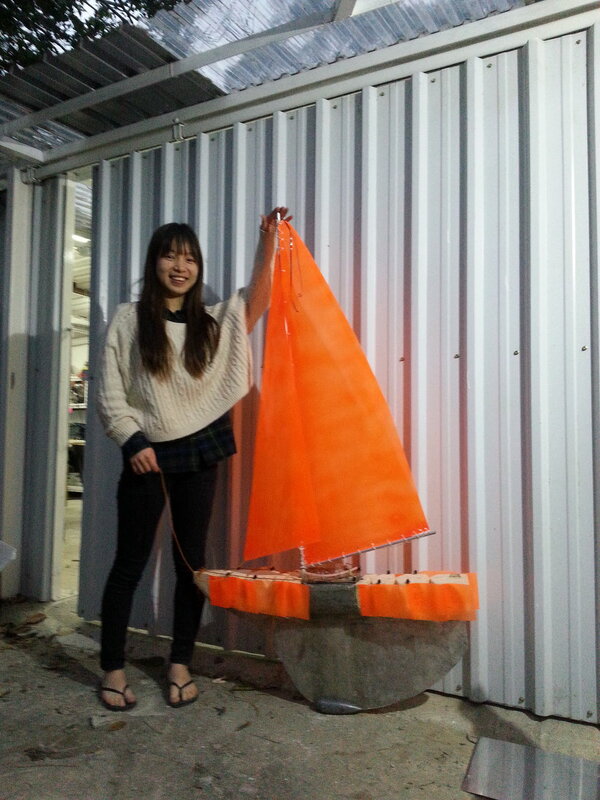 Finally, the mast is a aluminium tube of 13 mm diameter and the sails are in polycarbonate. In this version, the gearbox is combined to the cabin in order to reduce the size of cabin and the weight of the whole boat.Previous control system was used - one motor for sail control and one for the hull control. The performance of of system is fair in this boat as the range of hull shifting is not large.Since the power of motor is limited the long hull resulted in control difficulty. Wind condition : Average 2.5m / sec. Gusts at 5m / sec. Fiberglass spine works well ! 2 layers or regular 300gr / m2, bidirectional. 10 layers in the middle for the keel and two for the box containing the electronics. The hull is more modular than Birthday, but not quite enough yet. The weight of the ballast is good for this boat as it provides a powerful righting moment. The sail and hull control range are not wide enough. Not powerful enough for this length of boat. We need to build a smaller boat, that has more control. We previously abandoned the idea of speed control. Bright orange sail is well visible and safe. As we are sailing / testing in the busy Hong Kong Waters, this is very important. The control box is not easy to open. 4. OK : Minimize the space between the section to minimize turbulences : scales. We used scales, however, we do not know if that significantly enhanced performances. 6. OK : find a solution to not have some water into the wooden box. No leak. But it was a lot of work to put the 8 screws on the deck + silicon joint. 8. OK : find a solution to adjust easier the ropes for curving the hull. The holesin the spine are a good idea.